How does a roof with dirty black streaks create a business opportunity? 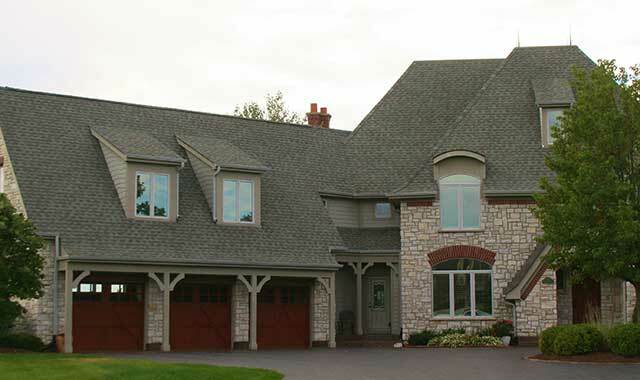 Find out how this McHenry Country-based company got off the ground and discover how it can ensure a fuller life for your roof. House Shampoo uses an environmentally safe solution to clean and restore roofs and other surfaces while removing algae colonies that grow on the roof. The company’s proprietary solution is applied with the same pressure as a garden hose. You may be looking at those black streaks on your roof and thinking they’re just dirt; but actually, they’re a sign of living algae colonies that are damaging your shingles. Algae is most noticeable on the north and east sides of your home, where there’s less sunlight and more moisture. Algae attracts lichens, which attach themselves to all types of exterior surfaces. Over time, they loosen the protective granules on asphalt shingles or burrow into the cedar, thus exposing the underlying materials to the elements. These stains look dirty and unattractive on your home, and in excessive amounts they can actually pose a health concern to children, older people and those with allergy sensitivities or upper respiratory issues, says Zylinski. House Shampoo began when Zylinski purchased an eight-year-old house whose roof was covered with black streaks. Zylinski, who has several years of business development experience, partnered with Gary Rogers, a 40-year veteran of the roofing and exterior trades. Together they developed a custom cleaning solution. Now, the pair are sharing their expertise and unique solutions with homeowners around the suburban area and beyond. Before beginning a job, experienced crews determine whether a roof requires a good cleaning or simply needs replacing. In one visit, House Shampoo can eliminate algae from a roof, thus expanding the life of cleaned surfaces. The application keeps algae growths at bay for several years. House Shampoo treatments can restore a roof such that it looks brand-new, thus enhancing its appearance. It’s pretty handy for homeowners looking to attract potential homebuyers. House Shampoo uses its environmentally safe, proprietary solutions to thoroughly clean and restore all types of surfaces. The solution is applied using the same low pressure as a garden hose, and it’s safe to use around garden beds, ivy or other landscaping. Zylinski says House Shampoo’s process is much more effective than pressure washing, because the company’s solutions work in a different manner. Zylinski says one of the best parts of the job is finishing a project and seeing the shocked look on a customer’s face. This entry was posted on Tuesday, May 1st, 2018 at 11:58 am	and is filed under Home & Garden. You can follow any responses to this entry through the RSS 2.0 feed. Both comments and pings are currently closed.